Taking out the intestines to get the spleen out? Thats a new one on me! Big Spleen, Little Spleen… wait, where’s my cardboard box! As I have no more news (other than complaining about my arm being dead for three days from vaccinations against Pneumonia and Meningitis which only last a year…) Just to mix things up a bit I have included the email exchange that I had with a lady in America who I was referred to as having had her spleen removed. Very interesting to hear her view on it and what a life without a spleen could be like! This email is a bit random but I have been put in touch with you by my friend Jess, who mentioned that you were friends in school. She also mentioned you had your spleen removed (kind of why I’m emailing) and I wondered what practical effect this had on you. I am thinking about having mine taken out and other than Wikipedia (which is always accurate) would like to find out from someone who has had it out what impact it has had, taking the antibiotics and on illness, before/after. Jess has probably told you why but if not then this blog should hopefully make my interest a bit clearer. I got mine taken out in middle school, so I was quite a bit younger than you and much less aware of things. Frankly, up to this point in my life (and hopefully for many years more), there has been very little impact on my day-to-day existence. After my spleen was removed I was instructed to take penicillin every day, and being an immature middle schooler (probably with ineffective parents) I promptly stopped taking the antibiotics. I have not taken anything since then, and have had no problem with infection or anything. My doctor at that time said that perhaps this was a good thing, as taking so much penicillin might have the opposite effect, making bacteria immune or less resistant to that antibiotic. At the time my spleen was removed, I was warned that in case of a bacterial infection my situation might be very dire. I had numerous vaccinations after having it taken out (pneumonia, meningitis, etc), and I suppose if some very serious illness came along it would be extremely important for the hospital to know that I had no spleen (in fact I heard of this happening to another person, who was very sick until medical personnel figured out he had no spleen). However, I’ve had many colds, ear infections, some rather serious including a high fever, and have never taken more than a week to recover. I haven’t taken any steps to change my diet and eat a lot of iron-rich foods or anything; in fact, I’m pretty woefully ignorant of what I might do that would benefit my body. Since I feel really healthy and pretty much forget that I have no spleen (except for the huge scar on my stomach) I’ve pretty much done nothing out of the ordinary in terms of lifestyle. Post-operation I was in the hospital for 2? weeks or so. I was put on morphine to help with the pain, but that memory is pretty much gone, except for pressing the little button they gave me whenever I felt I needed it. (I think there was a controlled dosage and only every so often.) I couldn’t eat for awhile either, and since they take all of your intestines out during the operation, it was a while before everything sorted itself out and I could use the bathroom normally. They also cut a nerve, I think, during the operation, and nerves are very slow to grow back, so I still have some numbness below the incision. My spleen was removed because of (all doctors concluded) genetic deformation in the blood vessels close to it, for some reason cutting off blood supply (I never got this straight) and enlarging the spleen. The enlarged spleen was eating all my platelets. I lived with it enlarged throughout childhood, with everyone in constant fear that it would rupture because of being hit by a soccer ball, etc, and finally (after visiting lots of doctors) someone decided that it would be less risky to just have it removed. The scariest part for me as a middle schooler post-operation was being put on a medication called coumadin, which is essentially a blood thinner. The doctors were not sure if the blood vessel deformation was genetic or because of blood clots. Coumadin requires regular blood tests to ensure the correct dosage, and you are supposed to always wear a bracelet or necklace saying you are on the medication, because if an accident should happen it is essential that you be treated as if you are on the medication. For me as a child, this was very inhibiting to my lifestyle, and the thought of always being inhibited by the medication was quite depressing for me. Luckily, after some genetic tests, my doctors determined that the blood vessel deformation was genetic and I went off the medication. Actually the only long-term (so far) ramification of having my spleen removed is a basic dislike of going to the doctor. I had to visit so many doctors, have my blood drawn so many times, visit the hospital regularly as a kid, that I just don’t want anything to do with it now. That’s probably a really bad thing, considering that I don’t have a spleen! Anyway, I hope this helps. Please email me again or phone me if you want some more info. Good luck with everything-it’s really hard to decide to have someone remove one of your major organs, but I guess you have to figure out what’s best for your situation. Not spleenless just yet, which is why I wanted to get in touch. ;). Interesting you haven’t ever taken the penicillin. I can completely understand how that would be at the time, but its good to know that even without them it hasn’t changed your life. Its an interesting point about bacterial immunity and one I have been thinking about. Have you had recommendations to start taking them lately, or do they pretty much just ignore the antibiotic option? I do have other issues, but this is currently the one in front of me, so that’s what I’m looking at at the moment. I’m due these vaccinations anyway, in advance of any decision, so at least it hedges my options. I can see how it would be important to keep the hospital aware of the spleenlessness, is there like a bracelet or band for that? I probably wouldn’t change my diet, its pretty good anyway. How big is the scar, like 4 inches, or is it actually huge? Not that I’m fussed, just interested. Was it very painful then? It won’t factor in my decision but it might effect my life in other ways (keen runner). Did it take long for you to fully recover, i.e. back to normal (weird to think of having your intestines taken out, I think with keyhole surgery I should avoid this but I will definitely ask in my second opinion! I’m lucky I don’t have the issue with the blood clots. I have had a ct scan and they say all my organs are fine, so that’s good. It might be more straightforward for me then, which is good to know. I’m getting used to seeing a lot of doctors. I don’t mind it as long as they treat me like an adult! Regarding the penicillin-I’ve pretty much ignored the whole thing-but I really should go to a doctor and get a checkup, see how all my platelet levels are, and get someone else’s opinion. I’m not recommending that you ignore your doctor’s orders too! You could ask your doctor about the recommendations for keeping people informed you have no spleen. I’m not aware of a bracelet, and I’m not actually sure how different any treatment would be-I’m guessing a heavier dose of antibiotics? My scar is pretty huge-it runs from above my belly button down to the side of my body on the left side. So 5 inches or so? But I also had my gall bladder removed at the same time (they discovered I had gall stones while taking out the spleen), and that scar runs diagonally the other way. The whole thing is like a check mark. Maybe medicine has advanced farther since I had mine out, but the thing I don’t like is that the staples (yes, metal staples holding your skin together) left scars too, so there are little scar dots on both sides of the scar. I don’t remember the pain at all-I think I was just too out of it to notice. I don’t even remember what the morphine felt like. But I do remember some of the recovery period. I was attached at first to tons and tons of wires and devices, an oxygen mask, IV, etc. They try to get you up and out of bed as soon as possible to avoid pneumonia, which I remember not wanting to do, and of course there was the uncomfortable (long) stay in the hospital, with nurses changing sheets, taking lots of blood, etc. I don’t know how the hospitals are in the UK, but here they are short-staffed of nurses, especially at night, and one of my relatives always tried to sleep there so that if I needed anything it wouldn’t be a long wait. I remember nurses constantly asking me if I had had a “bowel movement”-I was 12 or something and had no idea what a “bowel movement” was, except in some general sense. But I think that’s part of what determines the recovery time, because after things start to function normally and you’re able to use the restroom you can start having regular food. It was about 2 weeks in the hospital and then I felt pretty much like I could go to school, etc as normal. I would guess that any strenuous activity like running would be pretty tiring for a while, but a basic day-to-day existence would be fine. If you have got to the end of this then well done :). I have my second opinion next week on Thursday so shall be writing that up on Friday next week. Thank you for your continued support and having had a few people who I didn’t know contact me to chat on the basis of sharing please feel free to put this out far and wide! Hi, I just found your blog. 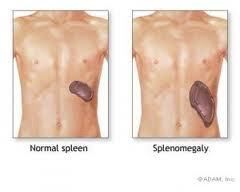 I was diagnosed with smzl in January 2010, my spleen was removed, I wasn’t given a choice, mine was 25″ long! I am going through my first relapse, being treated with rituxan, so far so good. I expect to be in remission in a few weeks. My doc thinks I may go through this again in three years, not too worried, I was told to think of this as a chronic illness rather than cancer, it makes it easier.